The studio is a whirlwind of activity lately. The biggest challenge may be finding an empty table! But despite several major projects in the works, we have just finished two. The first is our latest in the Earth Sampler Series, number twenty five! ESSXXV: Flash Gordon is a commissioned piece inspired by the comic dating back to the 30’s. My client is a NASA scientist and wanted to create a space-themed sampler. To start this project I chose from our sphere inventory to find the perfect miniature solar system. The Turee rhyolite in the center paired with the ammonite represents life on Earth, and flying away from our Earth is the first man-made inclusions in a piece: the interstellar explorer. The second completed piece is the Utah cross-section. 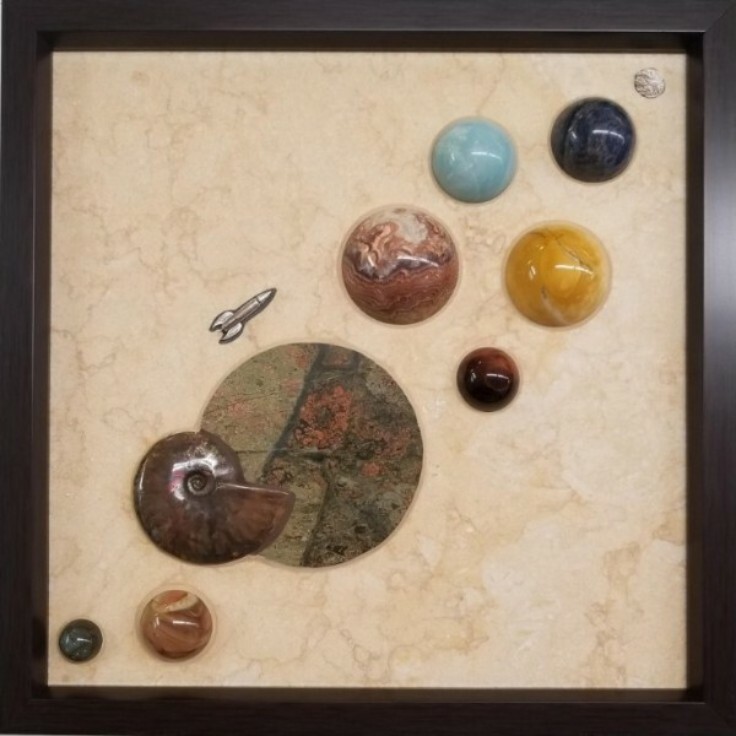 Based on a stratigraphic section of some of my client’s favorite Utah National Parks, this piece features 40 different types of stones, each representing a different geological formation. It’s been a huge undertaking, but I think the end result is striking! If you’re following me on Facebook, you may have seen a previous update about our Wyoming Geologic Map. The design is finalized, and the materials are officially decided. One of the most challenging aspects of my artwork is choosing from a multitude of textures and colors. It is almost like picking a favorite child… Each geologic unit on the map needs a corresponding stone slab, and the colors and contrasts between neighboring stones must be considered. So it turns into a very complex yet exciting puzzle. The next step – water jet cutting and assembly! As if that wasn’t enough, the North Carolina Geologic Map also is in progress. I’m working with my client to source a few more specimens before finalizing the design. Quarried stone slabs laid out for the Wyoming Geologic Map. North Carolina Geologic Map specimens on the reference map. There is a lot of inspiration to be gained by getting out and groking with the rocks. After reading Kirk Johnson and Will Clyde’s, “Ancient Wyoming,” I had a hankering to investigate some of the Bighorn Basin. So in early October we got our feet wet with a short trip to the southeastern side of the Basin. After soaking in Thermopolis, we really enjoyed the museum at Worland with their very detailed and interactive displays. 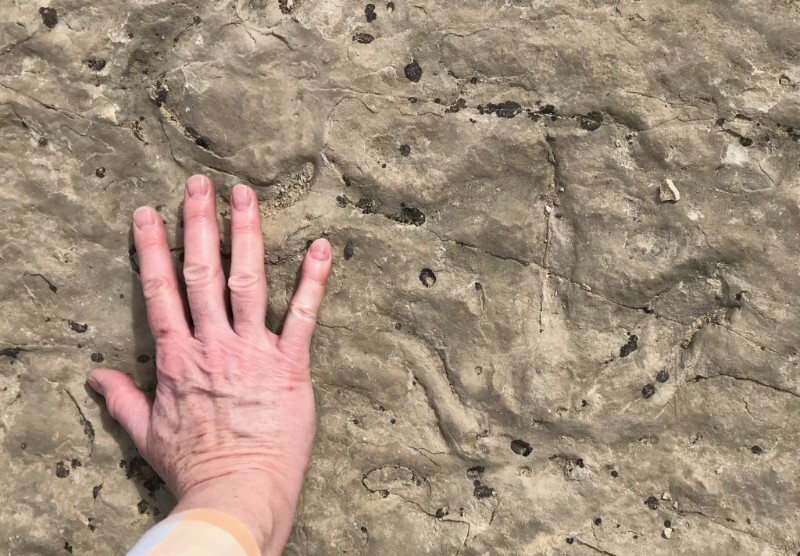 Then we took the ATV to the Red Gulch Dinosaur Tracksite east of Greybull where with a little imagination you can see the theropod prints. 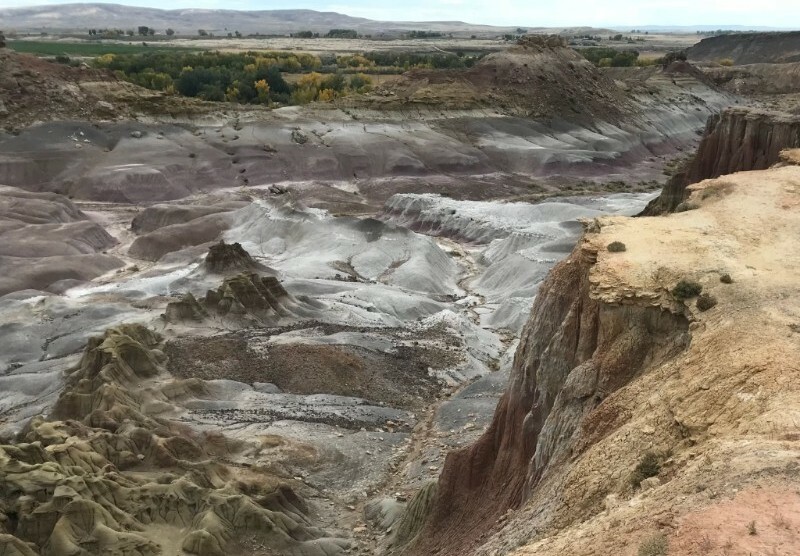 But my absolute favorite place was an erosional “badlands” basin called the Devil’s Kitchen. You can easily imagine the devil in the underworld mixing up geochemical concoctions in mile-sized cauldrons with the reactions oozing uncontrollably. Two vials of iron oxide, a pinch or two of calcium carbonate, and a few droppers of calcium sulfate could create vats of gooey kaleidoscopic mud. I always loved watching the colored mud drain out of drill rigs when I was it the field. It is great fodder for geofantasies! We are looking forward to digging deeper the next time we visit the Bighorn Basin. After finishing our last two shows of the year, we are already looking forward to our large booth at the Tucson Gem and Mineral Show! Mark your calendars, February 14th-17th. Hope to see you there!